CLARK COUNTY — The labor strife bedeviling school districts across the county, and across the state of Washington, could extend well into next week. A number of schools have now missed four days due to an ongoing teacher strike. School districts are wrangling with the unions that represent their teachers over exactly how much of the money sent by the legislature this year as part of the McCleary funding fix they can actually afford to spend. One group that has been largely silent as this debate boils over, are the lawmakers who crafted and passed the McCleary funding fix. ClarkCountyToday.com has reached out to a number of area lawmakers this week, but have only heard back from two of them. Asked if she would be willing to respond to further questions, Kraft declined. Kraft’s fellow 17th District Republican, Paul Harris, was one of the co-sponsors of HB 2242, the house version of the McCleary funding fix, and the lead GOP member of the House Education Committee. Harris did not respond to multiple requests for comment. In an interview with CVTV.org on Primary election night, Harris was asked for his feedback on the tensions being created by the McCleary funding fix, but declined to answer directly. Rep. Sharon Wylie (49th District) has not responded to multiple requests for comment, but was quoted in an article by KOIN-TV. “I believe that they have the absolute right to ask for more compensation and it was our intent to give them more compensation,” Wylie told reporter Elise Haas. 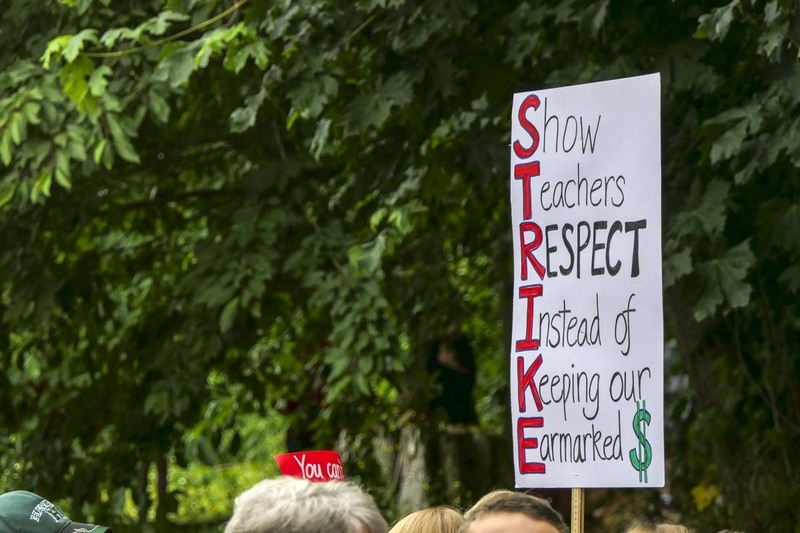 Her colleague, Monica Stonier, a former middle school teacher and current Evergreen Education Association member, has also come out in support of the unions. “While I might have more understanding, patience and perspectives in all parties involved, we sent money for salaries,” she said. Senator Annette Cleveland, also of the 49th District, has not responded to multiple requests for comment, nor has Rep. Brandon Vick of the 18th District. His opponent, Chris Thobaben, has come out strongly in favor of the teachers and their strike, but admits that he blames the legislature for the situation, rather than the districts. One lawmaker who was happy to speak with us is Camas Republican Liz Pike, who decided not to run for re-election in the 18th District. Pike said she voted against the bill because it represented a $5.5 billion tax increase and, in her opinion, did little to fix the overall problem. From Pike’s view, part of the issue goes back to parents failing their jobs. That has increasingly meant teachers having to deal with discipline issues and personality problems, which is a huge part of why unions and supporters say the huge pay increase is warranted. Another lawmaker who has been far from silent is Senator John Braun. The Republican from the 20th District, which includes part of Clark County, sent a letter to Governor Jay Inslee, Attorney General Bob Ferguson, and Superintendent of Schools Chris Reykdal on August 23, insisting that they enforce state laws prohibiting a teacher strike to force teachers to go to work. Braun says he has yet to hear back from any of those elected officials. Reykdal did release a letter he sent to district superintendents last week, advising them that he was aware of and concerned about the funding inequities in the McCleary fix. According to Braun, Washington state will be spending over $15,000 per child for basic education this coming year, between state, Federal, and local funding. For the first time since the early 80’s, the state is spending over half of its budget on basic education. We asked parents to weigh in on our Facebook page about how the strike is affecting them. The majority said, so far, they’re treating it simply like a slightly extended Summer vacation. Others said they’re using this as a teachable moment, about why they do or don’t support what the teachers are doing. A few said they’re working on school subjects on their own time to prepare for when school does start. A few commenters said the strike is costing them money, either by having to stay home from work, or else paying for child care. Perhaps most impacted are many classified employees of the school districts, such as cafeteria workers, janitors, and support staff. By state law, they don’t receive pay if they’re not working, and many are unable to work until classes start. Still, some of them said they’re happy to sacrifice if it means teachers ultimately get a better wage. Quite a number of parents brought up the fact that schools traditionally didn’t start until after Labor Day anyway, so they feel like this delay is actually more in line with where things should be. Should the strike continue for much longer, schools will likely be adjusting schedules during the year, as well as going later into the Summer to make up for days that were missed. What do teachers actually do? ClarkCountyToday.com spoke with several teachers separately, to ask them what a typical work day and year is like for them. A number of people taking part in the conversation about the strike online have said teachers work only nine months out of the year, and make a full-time wage. While the teachers we spoke with didn’t want to be directly quoted, they did paint a pretty similar picture. Most said they work anywhere from 1-5 hours per day beyond the 7.5 hours mandated in their contract. Most of that time is spent preparing lesson plans, grading paperwork, and sometimes working with students after hours. One teacher told us it’s not uncommon for him to work an additional 16 hours during the weekend to catch up on work from the week and prepare for the coming week. Nearly all of the teachers we talked to said they spend out of pocket for additional classroom supplies, usually at least $200 per year. Several also worked as coaches outside of their position as a full-time teacher. As for their Summers, the teachers said they spend both time and money attending conferences and taking mandatory classes in order to keep their teaching certificate current. Teachers often start work on schedules and lesson plans several weeks before classes begin, and often spend time after the school year going over transcripts and preparing for Summer. It’s fair to point out that many people outside of the teaching profession also spend considerable time outside of normal working hours doing their job. But it’s also not accurate to say that teachers only work 180 days a year, or 7.5 hours a day. Any teacher who did that would likely not last long in the profession. Most of the districts have said they plan to continue negotiations throughout the weekend in hopes of being able to reach a deal. It’s clear that some districts, such as Battle Ground, appear to have a much larger gap between what’s being offered and what their teachers are demanding. Teachers, meanwhile, have been showing up in force at rallies outside several district offices, and say they plan to continue picketing throughout the weekend. As confusion continues about what is happening with the money the legislature provided, several superintendents have released statements trying to explain things. “What the court actually ordered, was not an increase in salaries being paid to school employees (teachers, administrators, and classified staff), but rather than (sic) the state formulas be increased to pay for the current full and actual cost of those staff,” Steach wrote. “…in addition to the 21% increase in teacher salary funding, we also received an increase for Classified (37%) and administration (45%). The legislature didn’t intend for all administrators to get a 45% salary increase any more than the teachers to get a 21% increase or classified to get a 37% increase. It was a recognition of how far underfunded each one was in the state allocation from the actual averages being paid across the state. In an open letter to parents on Thursday, Vancouver Schools Superintendent Steven Webb explained it this way. “VPS gains more state revenue beginning this year, but we lose a portion of local revenue next year. Our net new McCleary discretionary funding gain is $24.4 million in 2018-19, then it drops to $14 million in 2019-20 and beyond. The Vancouver Education Association fired back with a statement of its own, accusing Webb and the district of making excuses and blaming the new state funding system. The union’s position is that the increase in state funding more than offsets the loss in local levy dollars, meaning the district can afford to give all of the added $52.4 million dollars this year, rather than spreading it out of the length of a three-year contract. In his letter to state Superintendents, Reykdal seems to indicate that he agrees with the districts. Reykdal went on to say he understands why negotiations have raised tension levels around the state. Despite those statements, Reykdal says it is his belief that the legislature intended for collective bargaining sessions to be wide open this year, with no caps on what kind of raises teachers can get. Some districts have settled for deals that give their teachers a 34 percent increase over last year. But Reykdal is clear that circumstances will be different depending on how districts had structured their previous budgets, and other factors that affect how future revenue will be distributed.